I have just discovered the most charming work of artist Pamela Corwin, the creator of her Paper Scissors Rock studio. Pamela creates original designs for her whimsical line of clocks, magnets, greeting cards and more. I am lucky enough to be the owner of the Pike Place Market clock. 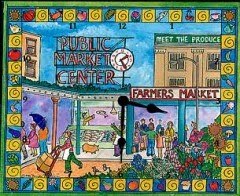 It is a painting of the front of the market, and it is truly one of my favorite things. Besides keeping track of time for me, whenever I look at it, I am reminded of this very colorful and famous Seattle landmark. The clock looks like ceramic tile, but it is actually so light you can hang it on a push pin and you never have to worry about it breaking. All clocks come with a lifetime warranty on the movement and there are over 70 designs to choose from. If you are in the Seattle area, be sure to visit Pamela and check out her booth right inside the Pike Place Market. She can be found there amongst the other crafts people and all of the flower vendors, seven days a week. You can also visit her website and order any of her products on line. If you are looking for a wonderful gift or just a very special treasure for yourself, Pamela's artwork is truly lovely. In addition to the giveaway we are hosting on our website, Paper Scissors Rock hosts monthy giveaways on their site as well. You can enter here. Be sure to come back and enter our giveaway too. Win a set of Magnets that are glass gem magnets that start with a tiny watercolor painting which is reduced to size and reproduced. The magnets are all handmade in the studio. They use super strong ceramic magnets so they will stay on the fridge unlike most magnets of their size. The gem magnets are 3/4" each and come in sets of seven in a gift tin with a clear lid. What is your favorite Magnet set on the Paper Scissors Rock website? *Limited to US residents; 18 years old and above. Giveaway starts September 21, 2011 and ends on October 5, 2011 at midnight PST. Winner will be emailed and has 48 hours to respond before another winner is selected. I was not paid for this giveaway or post. I was provide the item in this review for free by the company or PR firm representing them. The opinions on this item are 100% mine and may vary from others. IS THIS A OPEN GIVEAWAY? The Seattle ones are pretty. My favorite Magnet Set is the Wine Set - these are so clever! By the way, I love Pikes Market - we go there every visit to Seattle.